A surge in cases of equine influenza in the United States and Europe in recent months, including in vaccinated horses, has authorities delving into the circumstances. Equine flu is considered endemic in both the US and Europe, but the viruses causing the disease differ slightly. For many years, the viruses in circulation in the US have been “Florida clade 1” (FC1) whereas in Europe they have been “Florida clade 2” (FC2). These clades split apart in 2003; circulation of FC2 ceased in the US around 2005 and, by 2010, there was no evidence of FC1 in circulation in Europe. Because of the extensive movement of horses between North America and Europe, the international panel of experts on equine flu has recommended for the last 10 years that vaccines cover both FC1 and FC2. Some, but not all, available flu vaccines meet this recommendation. Professor Thomas Chambers, an expert on equine flu and equine herpes with the Gluck Equine Research Center at the University of Kentucky, notes the recent surge in flu cases in the US, Europe, and Nigeria. “Normally, the virus circulates at a variable, but fairly low, level in the USA, but virus activity surged in the last three months of 2018 with outbreaks in 12 states,” he writes in the latest issue of Equine Disease Quarterly. An extensive outbreak occurred in a donkey sanctuary in Nigeria. In England, it resulted in a temporary lockdown of at least 174 premises and cancellation of racing for six days in February. Outbreaks were also reported in California, Arizona, Ohio, Indiana, and Washington State. “Some of the horses in these outbreaks, in both the USA and Europe, had been vaccinated for equine influenza, raising the question: Is this a new strain that is not in the vaccines? There are, he says, two mutations that make them different from the recommended vaccines strains. But are these important? “That is still under investigation,” he writes. “The absence of FC1 from European circulation means their horses have no natural immunity and are dependent on vaccination for protection. Milder disease in flu-vaccinated horses may reflect an inadequate level of protective immunity following exposure to unvaccinated horses shedding large quantities of virus, he writes. Chambers proposes several strategies that horse owners can employ to protect their horses from the flu. Owners, he says, should familiarize themselves with the clinical signs of flu. Often, the first sign is a harsh cough. Other signs include fever and nasal discharge, which is usually watery at first and then turns thick and yellow. The horse may show unusually rapid breathing or lose its appetite. Sometimes, there is swelling in the lymph nodes in the lower jaw, or limbs swell up. Horses, he says, can be infected and still appear normal, especially if previously vaccinated. Other pathogens can produce clinical signs that look like equine flu, but aren’t, such as equine herpes virus 1, EHV4 or Streptococcus equi, which causes strangles. Chambers recommends that owners ask their vet to take a nasal swab or, ideally, a nasopharyngeal swab (which goes beyond the nostrils into the back of the throat), and send it to a laboratory to confirm flu. Horses, he says, should be vaccinated with a vaccine that protects against both FC1 and FC2 viruses. “Horses’ antibody responses to vaccination do not last indefinitely, so if your horse has not been vaccinated for six months or more, then it is due for a booster. “If it has been three months or less since the last booster, then hopefully your horse’s immunity should be at its peak. He recommends checking ahead with the manager or resident veterinarian at any facility where owners intend to take their horse. Chambers says biosecurity from infectious diseases is best enforced by avoiding exposure whenever possible. “For farms, the best biosecurity is obtained by quarantining newly arriving horses away from the general herd for sufficient time to assure that the new arrivals are not bringing diseases with them. Katie Flynn, an equine staff veterinarian with the California Department of Food and Agriculture, stresses that although vaccination plays an important role, it should not be relied on as the sole preventative for equine flu. 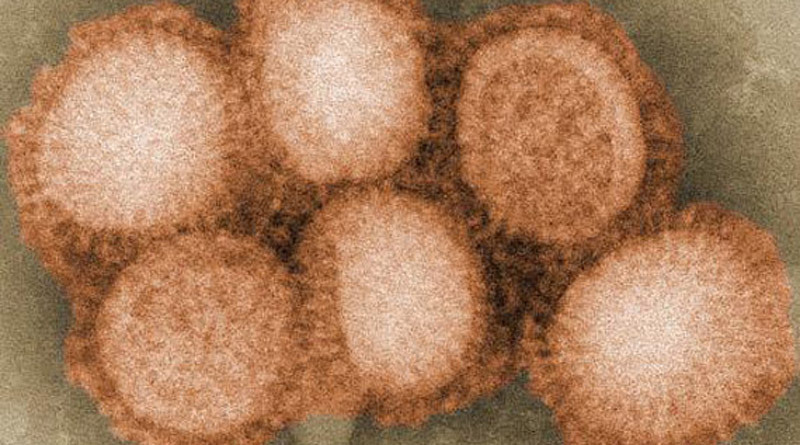 “Similar to other influenza viruses, equine influenza virus mutates over time and vaccines must be periodically updated to keep current with circulating viruses,” she said. “Horses that have been vaccinated in accordance with manufacturer’s label instructions and the recommendations of American Association of Equine Practitioners may be protected against equine influenza. “Studies suggest the use of the modified live intranasal vaccine in previously unvaccinated horses can provide protection within five days of primary administration. Implementation of biosecurity measures is essential to protecting the health of horses during influenza season, she says. “As influenza virus is spread most readily through nose-to-nose contact, it is critical to limit horse-to-horse contact and require strict isolation of new arrivals and sick horses. “Infected animals should be kept at a minimum distance of 50 yards from healthy horses. If no suitable permanent isolation stable is available, then designate an area on the property where a temporary isolation structure can be erected. “When no appropriate on-site isolation areas are identified, consider appropriate off-site isolation facilities such as vacant barns, empty fair or event grounds, or veterinary clinics. Flynn says people who must care for animals both in and outside of isolation should handle healthy animals first and isolated animals last. Individuals caring for exposed or infected horses should use alcohol-based hand sanitizers after handling all horses. Influenza virus can be inactivated by exposure to sunlight or by use of disinfectants. The virus can remain viable for up to two days on contaminated surfaces, specifically solid surfaces of stall door latches. “Thus, any shared equipment should be thoroughly cleaned and disinfected between uses. “The critical factor in controlling and preventing the spread of influenza virus is monitoring the health of all equids. Monitoring includes taking body temperatures twice daily and recording all clinical observations. “Only healthy horses, which have been monitored, should be permitted to leave the premises. Any horse showing clinical signs of respiratory disease should be immediately isolated and examined by a veterinarian. Respiratory shedding of the influenza virus can persist for 7-10 days after infection in a naïve animal. Horses should therefore remain isolated for at least 14 days. Appropriate use of vaccination and implementing biosecurity measures are critical to protecting the equine industry from highly contagious equine influenza virus.